The Johnston High School classroom building. On the right is the gymnasium, the only building in the picture which is still standing. On the left is the principal’s house, occupied by the Ap Powell family and later the Marvin English family. The following stories ran in the print edition of The Edgefield Advertiser on July 4, July 11 and July 18, 2012, and held much interest for those connected to Johnston and the school which no longer exists. Here they are, in sequence, for all to see. The Tompkins Library in Edgefield recently received a gift of a twenty-page mimeographed newspaper published at Johnston High School in late 1944.Albert Booth of Trenton was the donor. The eleventh-grade typing class claimed credit for the paper. That was then the senior class; South Carolina added the twelfth grade a few years later. In this article I will summarize highlights of the paper. Mrs. Archie Lewis, Jr., was faculty advisor. For many years, she and her husband have lived in McCormick, South Carolina, where they were associated with the John de la Howe School. Eleven staff members are listed at the top of the first page. Rachel Clark, now Rachel Chenaie of Kentucky, was editor-in-chief, and June Herlong, now June Rauton of Johnston, was Literary Editor. Joe King, who has continued to live in Johnston, was Circulation Manager. Dan Lyon, who has lived in the Atlanta area for many years, was Sports Editor. None of the articles in the paper are signed. A two-page editorial entitled “American Women in the War” gives examples of the kinds of work done by military and civilian women. World War II was almost over, but in 1944 no one knew exactly when it would end. A one-page piece called “Christmastide” tells about customs of the season and ends with a Christmas poem by Eugene Field, a popular author of poetry for children. Short humorous items mentioning students fill a two-page section called “Just Between Us.” According to the first entry, “William Rauton is still seeking an answer to ‘Is You Is or Is You Ain’t My Baby?’” That was the title of a popular song. Mr. Rauton has lived in Johnston all of his life and married his schoolmate, June Herlong. Other students mentioned in cryptic entries were Betty Derrick, now Betty Bland Dowd of Johnston; Ada Reid, now Ada Clark of Johnston; and Frances Earle Halford, now Frances Sanders of Columbia. The “Sports” column gives the date and outcome of all the football games which the Johnston Bears played in the fall of 1944. The Johnston team, coached by Ap Powell, won seven games and lost two. The Bears celebrated their sixth straight win over Edgefield, arch-rival. “Edgefield was a tired, beaten and badly bruised team after the final whistle,” the writer said. A two-page feature called “Laughs” used students’ and teachers’ names in jokes. In one item, the late Gertrude Eidson, the science teacher, said to Lowell Clark, “Every day we breathe oxygen. What do we breathe at night?” Lowell’s reply was “Nitrogen.” The Reverend Lowell Clark is a retired Baptist minister who has always lived in Johnston and married his schoolmate, Ada Reid. The three-page “School News” section contains entries about all eleven grades. In the First Grade entry, I was amazed to see my own name. Our teacher, the late Inez Carson of Edgefield, asked me what I was so busily doing, and I replied that I was writing Christmas verses. According to the Fourth Grade entry, the twins Billy and Charlie Duke were planning to join their father in Florida. Their mother, the late Willie Waters Duke, had brought them to Johnston, her home town, while their father was in the war. The late Billy Duke became a physician in Lancaster, where the twins grew up except during the war years. Charlie Duke was an Apollo 11 Astronaut and one of the few celebrities associated with Johnston. He now lives in Texas. A writer for the eleventh grade wrote, “It’s not conceit but pride when we claim to be one of the most outstanding graduating classes of Johnston High School.” Who can dispute that claim? “Santa Claus Letters” cover two pages of the newspaper. These were signed by high- school students who were much too old to be writing such letters. Many letters included puns on the names of romantic partners whom I can’t identify. Writers included Jackie Feagle, now Jackie Holmes of Johnston; Elaine Clark, now Elaine Humphries of Batesburg-Leesville; Jule Bland, now living in Lexington; and the home-economics teacher, Dorothy Oates, now Dorothy Herlong of Edgefield. “Club News” now occupies two pages of the paper. The clubs were 4-14, Physical Ed, the Glee Club, the Future Farmers of America, the Beta Club, and the Junior Homemakers of America. The last two pages of the paper contain short advertisements for twenty-one local stores. The only one in business today is Maxwell & Halford Drugs. For a closer look at this newspaper, stop by the Tompkins Library at 104 Courthouse Square in Edgefield. We thank Mr. Booth for giving the Library this piece of Johnston memorabilia. I enjoyed very much reading the story on the Johnston High School newspaper from 1944 (Advertiser, July 4, 2012). I especially liked the “Sports” column which was about Johnston beating the Edgefield Bulldogs in the fall of 1944. I played in that game and the writer’s words “Edgefield was a tired, beaten and badly bruised team after the final whistle” was accurate. I know because I was on the Edgefield team. If I remember correctly the score was 40-0 or some similar number. The one player I remember from the Johnston team was “Tiny” Yonce. The Edgefield team included: Nathan Padgett, John Lanham, Cooper Watson, Calvin Bartley, Thomas Rowe, Thomas Denby, ? Shaw, Melvin Shaffer and J.W. Cheatham. There were others. I wonder how many players who were on the Johnston and Edgefield teams are still around. Ed. Note: Anyone wishing to identify those in the above picture, please call us or email the names. As a member of the Johnston High Class of 1945, what a treat it was to read Owen Clark’s article about our school newspaper. The copy of the late 1944 paper was donated by Albert Booth. Although he would be too young to remember, Albert’s parents were our next door neighbors on Mims Avenue when he was born. As he was the only infant nearby, the Lyon children called him Prince Albert, a name most commonly associated with a pipe tobacco put up in bright red tins. The fact that he had bright red hair might have figured in. A long time ago, eh, Albert? Our editor was Rachel Clark, the number one student in our class for eleven straight years, and by a comfortable margin. I was told that her grades did not drop off while she was at Winthrop. There were twenty-six in our graduating class, thirteen of whom attended college. Several members were the first in their families to finish high school. We were about fifty-fifty town to country ratio. One member had married five years earlier, dropped out, but returned in 1944 to graduate with us, which was very commendable. 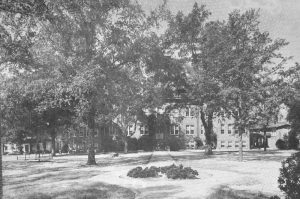 All eleven grades were housed in the same building. In grammar school our role models were the high schoolers, whom we saw on a daily basis, although they paid no attention to us. But all in all, you might say we were one pretty happy family. I am curious to know who wrote the two-page editorial “American Women in the War.” She may have been ahead of her time. Could she have been a pioneer? Feminism was by no means a hot topic in those days. I am a husband of a working wife, a father of a daughter, a brother to two older sisters, all of whom are smarter than I, so I have been without male support when a family member would expose me to “the real picture.” Congratulations, girls. Your hard work has paid off. Oh, we got “shook up.”In 1943 Billy Hart, who was a couple of years older, died in a plane crash at a Marine Air Base in North Carolina. Gervais Salter, who was in my sister’s class, was wounded in the Normandy invasion. Then in our senior year Frances Schumpert Lewis, our typing teacher and paper advisor, got word that her husband, Archie, had been wounded in Italy. She continued to teach. What else could she do? It must have awfully hard, especially with a roomful of high spirited teenagers. I cannot remember, but surely we had the sensitivity to be more considerate in her time of distress. I would think so, because all of us were brought up well at home. In 1945 Thomas Earl “Doc” Fulmer was wounded in Europe. These were all people we saw at Johnston High. To a lesser degree, even our house was touched. My sister Eva graduated from Winthrop in June 1944. On Saturday, July 1, she married Lewis Holmes who had just graduated from OCS at Fort Benning earlier that week. Three or four days later, they headed for Camp Gruber in Muscogee, Oklahoma, taking along their best man, a fellow OCS graduate, as a spare driver. Before Thanksgiving, Eva was back home with us, Lewis having shipped out with his division to Europe. Sadly the best-man-driver was killed in action. Meanwhile, my other sister was in nurses’ training at Columbia Hospital. After the school day, our social life consisted of loafing at Maxwell & Halford Drug Store, and after dark at the Tastee Grill. And we could always catch a movie at the Liberty Theater. Ah, yes, our football team. In 1944 we lost two of the first three games, although the first was by a 7-6 score. Then we won the last six by convincing scores, and with only seventeen players on the squad. In those days there were no “pee-wee leagues”; however, most of us had played together in pick-up games, usually tackle and always without pads, since the first or second grade. Then when the war started, the state mandated a compulsory one-hour physical period for the boys, consisting of calisthenics, running the obstacle course, and more running. The intent was to prepare us for the military, but Coach Powell was also thinking of the football benefits. Of course, there was a Herlong on our team. In those days for a long string of years, Johnston football always had a Herlong. How did we scrimmage with only seventeen players? Answer: Without a secondary on defense. To overcome lack of bodies, we did lots and lots of two on one drills. Owen quotes me, sports editor of the school paper, as saying, “Edgefield was a tired, beaten, and badly bruised team after the fmal whistle.” In those pre-Thurmond days, Edgefield­ Johnston was a hot rivalry. Those words sound to me like a forties version of trash talk, which I consider unacceptable. Always respect your opponent and hope he reciprocates. Victory is not a given. Belatedly I apologize to the Edgefield team for my over-the-top remarks. Today I follow the Thurmond team in the Advertiser and love to tell people what a powerhouse it is.